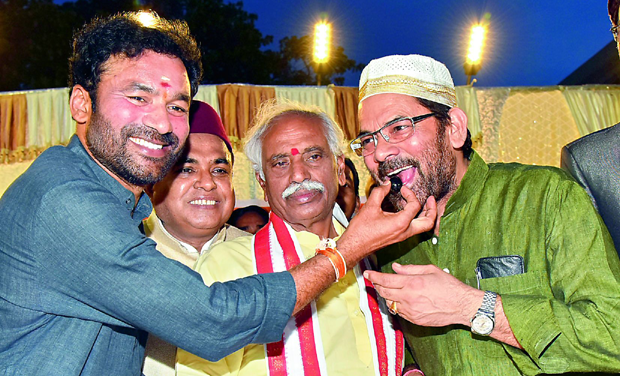 Hyderabad: From adjustment of work hours to inter-faith Iftars, people from the city are proving that the famed Ganga-Jamuni Tehzeeb of the region has not faded. There have been several inter-faith Iftars hosted in the city which have become a platform to discuss the problems faced by the communities and how the bond can be strengthened. Such parties are usually preceded or followed by discourses which have eminent speakers discussing how the communities should converge steadfastly for the common cause of societal well being. One such event was the ‘Inter-faith Iftaar: Dialogue and Dinner’ held on July 11, where people from across all faiths and walks of society congregated at the Roda Mistry College. Not just the politically conscious, but businessmen too have been organising the inter-faith Iftar parties. The Shah Ali Banda Jewellers Association, which has people from all faiths, recently organised an Iftar party which was attended by officials from the various departments. Professionals and employees of private firms shared how their colleagues helped them out by exchanging shifts and sharing work during prayer time.